Bob Chilcott describes Wenceslas, the largest work recorded here, as an 'entertainment': and what a revel it is. First performed by the multiple choirs and orchestra of the John Lewis Partnership (who commissioned it) the work is here expertly performed by Choralis under the watchful eye of the composer. This recording comes at the end of a very fruitful and happy period of time I have had as associate composer with Choralis and its conductor, Gretchen Kuhrmann. For me, one of the great joys of my work has been the way that rewarding friendships and relationships have been forged with choirs and groups of singers from all over the world. Choirs everywhere are made up of people from all sorts of different backgrounds, from school children and students to office workers, public sector workers, teachers, doctors, stay-at-home mothers and fathers, lawyers, politicians, people who have retired—in fact, people who live and work in all kinds of circumstances. For many, though, the choir becomes a very important focus in life. It becomes the place where you leave many aspects of your life at the door, and become part of a community of people who give their time, their energies, their resources and their goodwill to experience singing together and creating transcendent moments of shared beauty, laughter and positivity, motivated by a common love of music. Choralis is such a choir, a group that gives integrity and life to all that it does. For many choirs, the Christmas and holiday season is a busy time of year. As someone who has sung in a number of choirs, I always enjoy trying to compose new music for this season. In 2014 I asked my friend, the poet Charles Bennett, to write an entertainment based on the legend of the Bohemian King who braved the winter weather with his page to save the life of a poor peasant. I managed to find a way to incorporate the melody of the famous carol, Good King Wenceslas, into each of the movements, culminating in the audience singing with the choir and orchestra in the final verse in the last section of the piece. Wenceslas was written for the 150th anniversary of one of the most loved department stores in Britain, John Lewis in Oxford Street, right in the centre of London. The John Lewis Partnership, made up of some 46 stores across Britain, is owned by all its partners, nearly 90,000 of them, and they all share in the profits and successes of the business. John Lewis has its own orchestra and choirs and for the first performance of this piece, singers from stores from all over the country came to the Royal Albert Hall in London to perform. I wrote this recorded version, with a smaller instrumentation of brass, organ, and timpani in 2016, and it was premiered by Choralis in Washington, DC, in December of the same year. In 2008 the conductor Philip Brunelle asked me to write a piece for his church choir in Minneapolis, MN and sent me a book of poems by Kevin Crossley-Holland which included four beautiful Christmas texts. Over the following three years I set all of them for different choirs and we have recorded two of them for this disc. The first, Jesus, Springing, was written in 2010 for the choir of Harrow School. The second, The Nine Gifts, was written for J Reilly Lewis and the Cathedral Choral Society of Washington, DC in the same year. J Reilly Lewis, a deeply respected conductor in Washington and also a great supporter of Gretchen Kuhrmann and Choralis died suddenly in 2016, and the recording of this piece is dedicated to his memory. A few years ago Kevin Crossley-Holland sent my wife and me a copy of his beautiful children’s book about the nativity, How Many Miles to Bethlehem?, as a present for our daughter. A little later a poem based on the book arrived in the post from Kevin, and he asked if I would be interested in setting it to music. The opportunity arose some months later when I was asked to write a piece for a concert in London to be given by the BBC Singers and the harpist Tanya Houghton. The piece was recast with the title My Perfect Stranger and consists of a short dramatic scena, bookended by a newly-written Prologue and Epilogue. We premiered it at Milton Court in London in December 2016, with The Finchley Children’s Music Group, The BBC Singers, and Tanya Houghton. 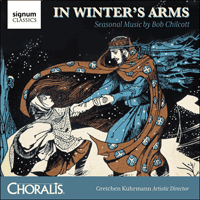 Gretchen Kuhrmann and Choralis embraced my associate composer role with the choir wholeheartedly. It began with a performance of my Requiem at the Chorus America Conference in Washington, DC in 2014, and continued with a spring 2015 concert performance of my Salisbury Vespers as well as William Walton’s Belshazzar’s Feast at the National Presbyterian Church. Just about every brass player in the city played in that concert and it was then that I got to know the players of The Classical Brass Quintet who play on this recording. These distinguished musicians are good friends to Choralis and it is for both these groups that I wrote my Gloria which they premiered in The Church of the Epiphany in Washington, DC in December 2015. I have sung and conducted a number of great Glorias by the likes of Vivaldi, Poulenc, and John Rutter, and so it was with a certain amount of trepidation that I approached the writing of this piece. A few years ago, a young American singer from a children’s choir festival I was conducting said to me that she liked the piece of mine that they were singing. She then told me that she had recently sung another new piece that she really liked by ‘some guy called Vivaldi’. She asked me if I knew him. I was so struck by this, because to this young lady the piece might have been written yesterday. To her it felt fresh and communicative, and I thought, if I could emulate those feelings for just a few moments, I would be happy. Vivaldi’s Gloria was very much in my mind when I wrote my own setting. This recording has happened because of the support of so many people. I would like to thank Gretchen Kuhrmann, a very special musician, and the choirs of Choralis who have worked so hard to make this possible, and those who help the choirs by giving time and energy and their financial support. Thanks also to the supporting musicians on this recording, The Classical Brass Quintet, Marian Rian Hays, and Julie Angelis Boehler. Special thanks must go to Todd Fickley, a superb organist. We are also so grateful for the work of Kevin Bourassa, our sound engineer, and his colleagues from Arts Laureate. Final thanks must go to my friend and colleague, Val Withams, who has project-managed this recording and who understands so deeply the reasons why we need to reach out and connect through singing together.